Me from literally three years ago. For reference, it was these flowers set alone in the second bounce! I missed riding though. Two sort of days off and I’m itching to get back and get the shedding blade on Oats, who is shedding like crazy. We had a jump lesson last night and it was so interesting. Kudos to my trainer for coming up with the most intricate and challenging courses in the indoor. It’s not an easy feat and it’s hard with limited space/jumps, etc. We first worked over a gymnastic, trot-in. Here’s where I was really proud of myself. In the gymnastic, I was having trouble with my hands pulling ‘upwards’ instead of releasing downwards. I was also leaning too far with my upper body. Nicole suggested I think about releasing with a straight arm to fix this. I thought about it and asked if she was thinking of an automatic release-style? Yep she was. And the green boxes were the first part of the second bounce! And I was able to go through the grid, and DO EXACTLY THAT. A modified – not true- auto release to fix my hands/upper body. Do you see that? I thought about what she was asking, tried to picture it in my head, and DID IT! This is amazing for me. We then started working on other elements – there were a lot! Start with one skinny on the straight away, to a 3-jump bounce that included a stand-alone skinny filler as the last bounce element (?!?? this was tricky), back to trot and through the three-fence gymnastic, canter to a two-stride x-rail to small oxer, canter back over the 3-jump bounce going the other way (woo! ), to a bounce using just fillers (green box, and flower boxes, to a 3-stride to the first element in the gymnastic, a small x-rail, and then back to the first fence- using it as the final element. Now, we didn’t just go ahead and tackle this all at once. We had to break it down- work over the bounces as poles, then as fences (this was tough! Oats deked around the filler part of the bounce a few times…bad pony and he stopped once). Then we worked over the two-bounce fillers (also surprised the HECK out of Oats at first, then he charged through it with gusto), and then we put the first half of the course together. I was REALLY impressed. It sure as heck wasn’t pretty but we made it work! Saw this movie the other night and it was pretty good, creepy, suspenseful and scary at times. It’s also a thought-provoker, as it brought up a lot of ‘hidden demons’ that people carry with them and force them to face as they move throughout the film. Interesting. Since I noticed last week that Oats’ canter was kind of strange last week (weak on the left lead, unbalanced, got flat when coming into fences and he just clobbered a fence…) I requested we do some work on strengthening his canter quality. I found a bunch of photos I had missed from the summer derby. Love it! So we did! A bunch of raised poles, starting at a distance of 9ft, and going through the exercise on the left, and right lead, slowing bringing the distance in to 8ft, 7ft, and finally collecting in to 6ft. Oats was great! He started off pretty badly, absolutely clobbbering the rails. It was like a yard sale! Horse by braille?? He was clunking them and just not.caring. Then, he slowly figured it out. He stopped clunking the rails, and started picking up his hoofies. Then I got even braver and bolder- I suggested to Nicole that we put up a jump on the other side of the arena, so that when I finished the collected poles, we’d turn and go over a jump, and then collect for the poles, and so forth. Like a big circle. She said ok, but that if she put up a jump, it was going to have to be an oxer! But that was fine, and you know what? That was why I asked for it. 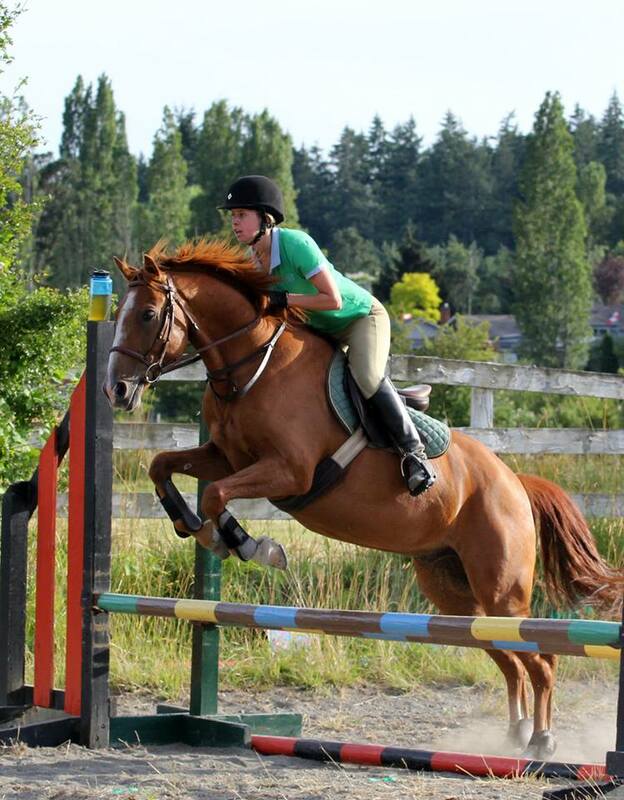 Ha, look at me, asking to jump an oxer…I said sure, as long as it was small. And it did start small, and then we worked up to maybe 2’6”. 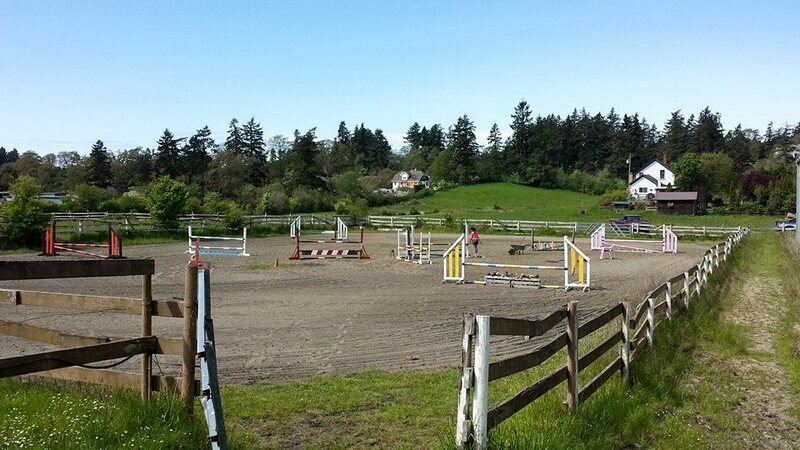 By the end of the exercise, the poles were set at 6ft, and the oxer was up to soft 2’6”, and we were doing GREAT. I am ordering this one too! What a good day, and what a cool exercise. I was out of breath, sweating like crazy. Oats was sweaty and huffing and puffing. A tough workout for the two of us! Then my dad and I went out for dinner to the Crooked Goose, and I had my favourite there- the barley mac and cheese with bacon and scallops. SO good and so decadent. Yummmm…. And here we are, making it look easy even though it really wasn’t!